It’s summertime, which means sunshine, watermelon and some of my favorite clothes! I’m just a few weeks postpartum, so I’m still wearing a lot of my maternity clothes. Although, when I find pieces that aren’t maternity and they still complement my body after baby, that’s always a win! I’m loving these pieces from PinkBlush right now! I got them in the mail towards the end of my pregnancy. I had hoped to wear them during my pregnancy, but little man decided to make his arrival a little bit early. What I love about both of them is that they can be worn during pregnancy or after! Can’t ever go wrong with that! 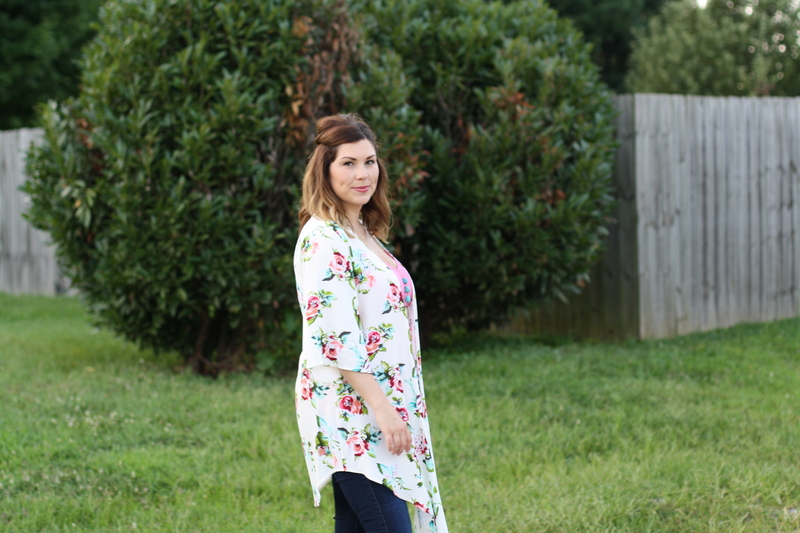 Floral is so in right now and this kimono is perfect! It’s from PinkBlush Maternity, but clearly can be worn without a baby bump. I love that this kimono has so many bright colors in this piece. It really gives you an opportunity to change up the look. I went with pink and turquoise, because frankly, you can never go wrong with the two. Especially combined! This floral kimono is super versatile and perfect for any occasion! I may even wear it as a swimsuit cover up in the future! How cute would that be? I’ll definitely be buying all of their cute maternity clothes next time I’m sporting a bump! Maxi dresses are always my go-to outfits in the summer and spring! Especially if any of them can be used as a maternity dresses! It’s super easy to just throw on one piece of clothing in the summer when it’s 150 degrees outside! They’re super cute and keep you cool! This particular one I am obsessed with right now! It’s seriously one of the most comfortable dresses I own. The tie dyed print and color are great! I find that maxi dresses are great for me as a mom because I can throw one on and feel put together and pretty. 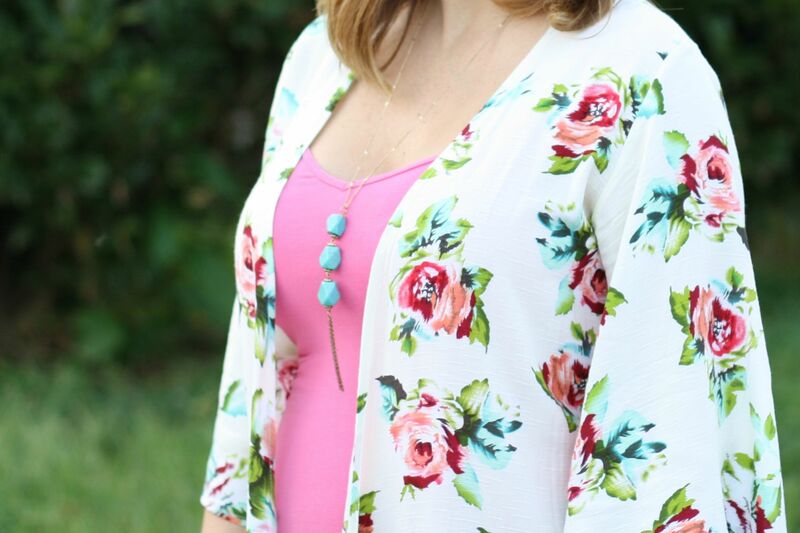 Plus, this one is perfect for the breastfeeding mama! Go grab yours here while they’re still in stock! 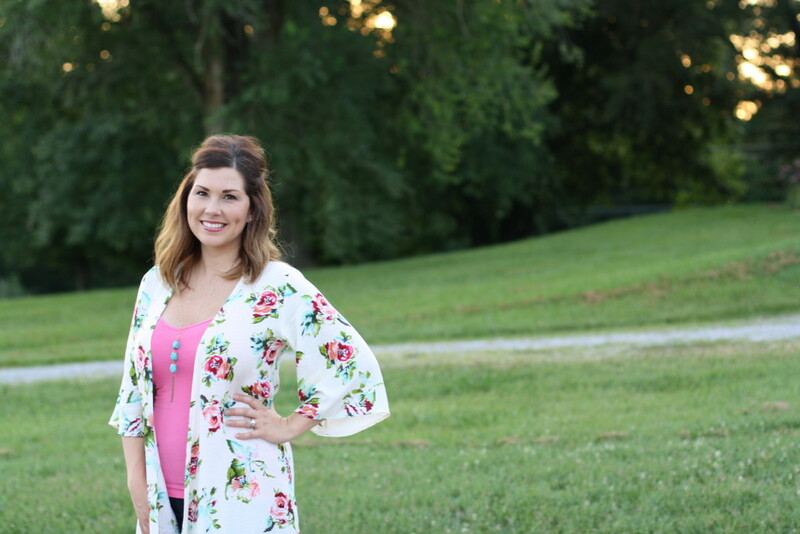 Did I mention PinkBlush and PinkBlush Maternity have 50% off all of their sale items right now?! Who doesn’t love a sale?! 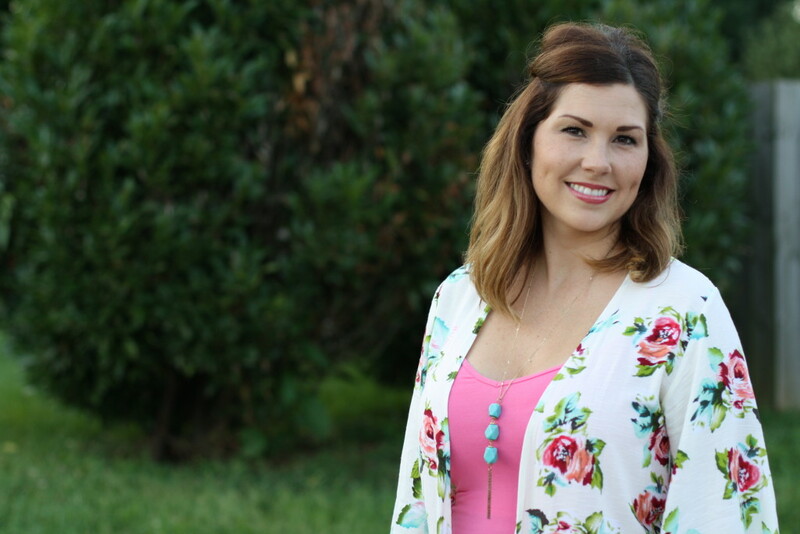 Check out PinkBlush and PinkBlush Maternity! You’ll find something you love! I promise! Hope y’all have a happy Saturday! You look so great! Wow, I wasn’t looking so hot a few weeks post partum. I always wondered about Pink Blush but am wary about ordering from places I’m unfamiliar with. I will definitely check them out now. I love that kimono!! Thank you, Lindsay! Oh, and you know I’ve got some spanks on under that top! Lol! No mama a few weeks postpartum has got a flat tummy! Pink Blush is awesome!! I love their clothes! You should definitely check them out! You styled this so well! love it!! Thank you!! :) It’s a great piece! Super cute & i LOVE those big gold disc earrings! Thanks, girl! These are some of my favorite! You look gorgeous! I love these looks – that tie dye dress is gorgeous and my favorite style for a maxi dress!! Gorgeous summer looks!! Thank you! Yep, you can’t ever go wrong with maxis! LOVE them!